Please Note:The shoe stretcher don't fit boots!!! This professional shoe stretcher solve shoes too small, squeeze feet, grinding feet and other issues. Fits both left and right shoe.Fit for flats, pumps, wedges, loafers, oxfords, pointed toe, slippers, sneakers,tennis shoes,high heels (<2.36inches). c.Rotate the hook clockwise,adjust the width. d.For best result,please keep shoe stretcher in place for at least 24 hours. 【A11-IN-ONE】A pair of shoe stretcher-stretch width and length fit for Women's Shoes Size 5-10.1pcs Boot shaper-Hold boots upright and keep them in good shape. 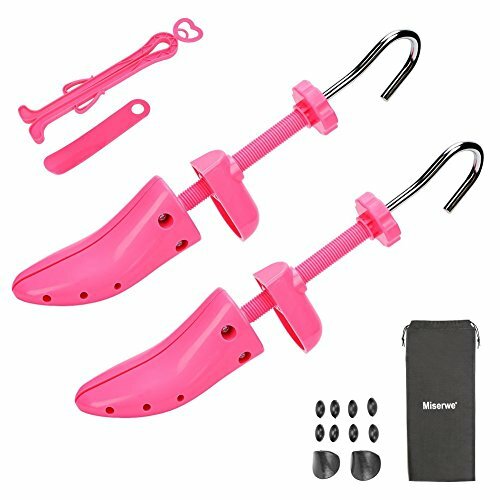 1pcs shoe horn-put on shoes easily.8 pcs bunion plug, 2 pcs Pad high plug-Inserts to stretch targeted areas known to relieve pain associated with blisters, corns or bunions.1 pcs carrying bag- Store all accessories.1pcs Instructions-Introduction the usage of the product. 【FIT SHOES】Fits both left and right shoe.Fit for flats, pumps, wedges, loafers, oxfords, pointed toe, slippers, sneakers,tennis shoes,high heels (<2.36inches). The Shoe Tree transforms any pair of shoes into perfectly fitting, comfortable shoes. 【2-WAY STRETCHER】Efficiently Stretches Length & Width of Shoes!Best used for breaking in your new shoes or loosening up older shoes that are just too tight. 【GET SHOES PERFECT FIT】This professional shoe stretcher solve shoes too small, squeeze feet, grinding feet and other issues,after use the shoe stretcher about 24 hours,your shoes will larger than before. 【WARRANTY】:We provide two year warranty time.If you have any question please message us. If you have any questions about this product by Miserwe, contact us by completing and submitting the form below. If you are looking for a specif part number, please include it with your message.